Building and adopting a new database always comes with challenges. MACC staff did a particularly good job of pushing us off the ledge so we could fly. We never had a Human Resources department or staff prior to integrating this service into our administrative operations. My time has been freed up to pursue initatives and growth opportunities. Working with MACC’s IT services brings a level of reliability and confidence for our day-to-day operations we did not have before. We all sense the reduced down time we have due to server and software issues. We trust MACC- the people we work with closely are both professional and friendly- a perfect combination. With their finance services, I don't have to worry about these management functions. Nonprofits are exploring social enterprise as a way to advance their mission. 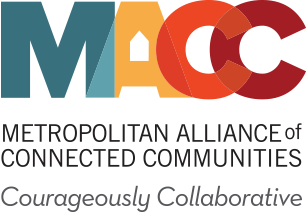 There is real potential in using MACC's collaborative approach to accomplish collectively what might not be possible individually. Influencing policy takes clarity, passion, and scale. By working together, we can participate in critical conversations that affect the lives of those we serve and the equity of the systems in our community. With their services we don’t have to worry about some of the more specialized legal and regulatory requirements – we’re able to focus on the work we provide in the community. For nearly 20-years, our member driven organization has shown that collective action and a collective voice is a powerful way to create transformative change. We provide innovative solutions so that our members can focus on what matters most—their mission. While each of our members has a distinct voice in the community, we are united by a belief that we have greater impact when we partner, connect and courageously collaborate with each other to achieve greater equality for those we serve. Are you ready to join us on our journey?